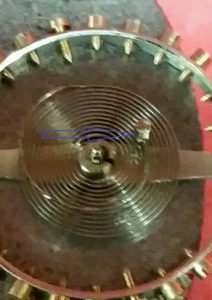 With the power released, if the watch is in beat the pallet fork will be centered between the banking pins on the main plate. It is usually fairly easy to see if the pallet fork is centered. It is put in beat by turning the hairspring collett on the balance staff. 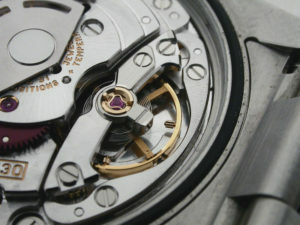 On some watches, it is difficult to see the pallet since it is sometimes covered up by the hairspring or pallet bridge. On this Hamilton 992b, the pallet is fairly easy to see. Balance wheel showing the stud and center collet. The collet needs to be rotated so that the stud moves forward or back. You can also adjust this before putting the watch together –with only the balance installed, the jewel must sit on a line between the escape and balance jewels (and pallet pivot jewels), andif you can see through, exactly between the banking pins when looking down this line. The stud has been adjusted and the pallet is now centered between the banding pins. 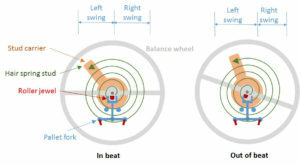 Getting the beat correct makes a large difference in the way the watch runs. 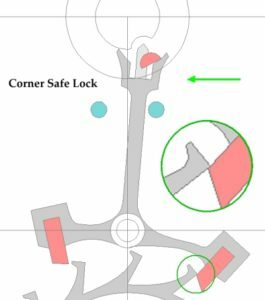 It will start instantly when wound, and keep time in positions much better, have better balance rotation. 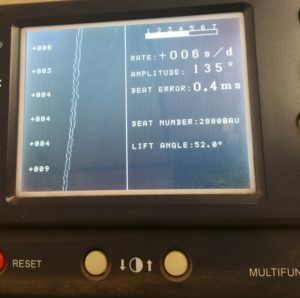 Timing machine before adjustment, watch is out of beat and running slow. The watch is now in beat, regulated and running 6 seconds a day fast,that is about as good as it gets!! 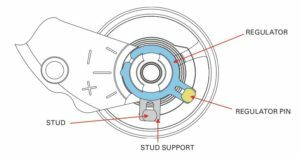 On more modern watches, they are made with an adjustable stud — quite easy to put into beat as you just move the regulator arm. 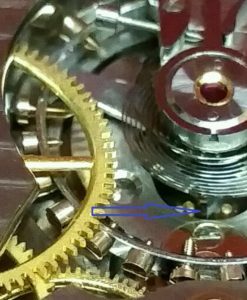 This Rolex movement also has a movable stud but no regulator. A Rolex is regulated by adjusting the 4 tiny screws on the balance wheel. Awesome. Thanks for explaining this! Thanks, just fascinating as usual. Use a higher power loop… Once this is no longer possible, retire! Thanks again for the info. I’m working on a ill Sangamo with that problem. Great post! Very interesting. Thank you for sharing your art! Thanks to your excellent explanation, I will look at my pocket watches more carefully. Well. I was not expecting watch repair 101 but…I Learned something. Thanks ,for a great Post! Now I know were that jewel thing goes.Take care Mark. 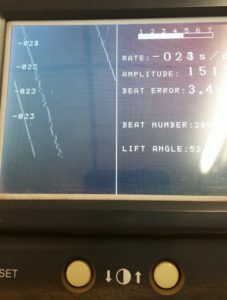 Thank you for sharing, It is always good to get a fresh perspective and pictures on watch repair topics. Keep them coming! Your blog is amazing with explanations and illustrations making it a must read for me. I have learned something very special owing to your professionalism and experience. Keep on going, Mark. Thanks. I’ve been struggling with the “beat” challenge lately. 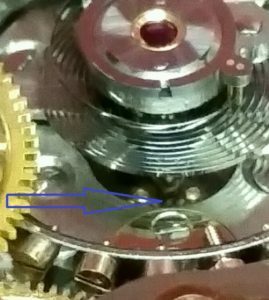 When you put the roller jewel as you suggest, it seems like you are making an assumption re the “wind up” vs the “release” of the hairspring. 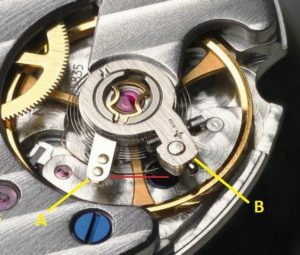 When the balance rotates CW, the hairspring is being wound tighter (incurring potential energy). 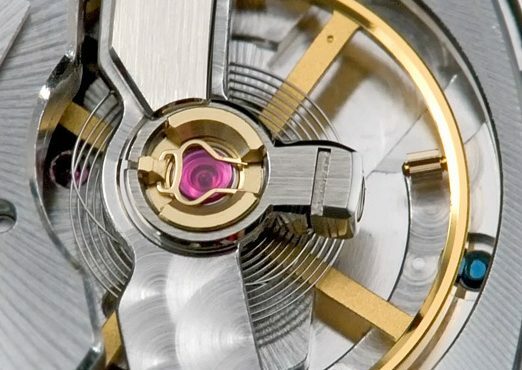 When the balance then rotates CCW, the hairspring is releasing energy for some period of time—–until it reaches its expansion limit (another form of potential energy ?). I have trouble believing that the opposite contraction / expansion are identical in time.